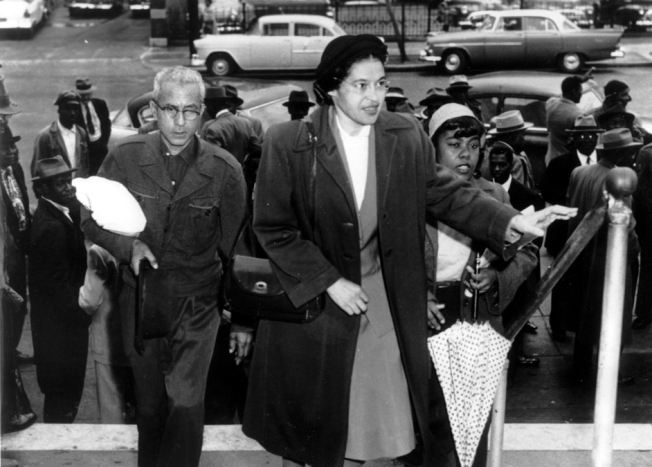 Rosa Parks arrives at circuit court to be arraigned in the racial bus boycott, Feb. 24, 1956 in Montgomery, Alabama. The boycott started last Dec. 5, when Mrs. Parks was fined for refusing to move to the black section of a city bus. Rosa Parks' archive of letters, writings, personal notes and photographs has been fully digitized by the Library of Congress and is now available online. The library announced Wednesday that the collection of 10,000 items belonging to Parks is available to the public. The collection presents a more complex portrait of Parks, who is remembered for a single, iconic act of civil disobedience. Parks refused to give up her seat on a bus in Montgomery, Alabama, in 1955, sparking a yearlong bus boycott that helped dismantle formal segregation. Parks, who died in 2005 at 92, wrote of feeling lonely and lost as she lived through the struggle with segregation. After her arrest, Parks lost her job as a tailor at Montgomery's largest department store because of her activism. Her husband, Raymond, lost his job, too, and the couple sank into deep poverty. They moved to Detroit but continued to struggle. She traveled with the NAACP, pressing for civil rights, and eventually landed a job at the Hampton Institute in Virginia earning $3,700 a year. Not until 1965 when Parks was hired for the district office of Michigan Rep. John Conyers did she finally earn a steady, living wage, archivists say. The collection reveals Parks had an aggressive edge and supported more radical actions seeking equality over the years, archivists said. She used her symbolic status to support Malcolm X, Black Panther gatherings and the Wilmington 10 in North Carolina.